This morning I read this really cool blog post over at Karen Mahoney's blog. It's a lovely post that really got me thinking. I think about this all the time and often wonder where this passion to write comes from. It's such a magical gift to have, and I consider myself very lucky to have been blessed with it. Anyway, go read it. 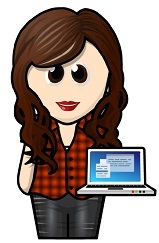 Karen's going to blog every day this month, so you don't want to miss out. And speaking of authours, Ericka Scott has unveiled her new website. It's lovely. You should check it out. Well, here we are again. Friday. The end of the week. Yay! Today I intend to tie up all the notes and teeny-tiny details that were bugging me about the novel I'm revising at the moment. Do you ever do that? Worry about the behind-the-scenes stuff? I like to get everything straight in my head so that it's reflected in the story. Of course, most of the time these details are things only I end up knowing about, but it's important to the flow of the story. Especially when you're working on a series. I've got everything figured out now, and will have my trusty list with me next week while I work through the final draft. I'm going to enjoy highlighting things off this list! ;) And you know what? As much as the second draft seemed to drag, I'm looking forward to getting stuck into the final one. This is when the story will be finalised, when I'll see all of my hard work actually pay off. It'll also mean that once it's done, I'll have completed another book and will be able to send it off to ImaJinn. Yay. But first, I'm going to put my latest newsletter together so I can send it out before today is over. I might even submit another novella I've been meaning to send for a few weeks but kept forgetting. Hey, thanks for the shout out. :) I feel truly blessed with the writing desire, too. There is something magical about it.